Posted July 15, 2014 by Kurt Henninger . How much does Adwords Cost? This is a very common question that we hear from SME (Small to Medium sized Enterprises) businesses who have never had any kind of experience in marketing their business online or are just dipping their toe into online advertising. Before we delve into the mindset you need to have in order to successfully utilize Adwords or any other kind of pay per click platform or display media channel online let’s ask the question of you the reader. How much do you think does Adwords cost? d) You can set your own budget and can spend as much or as little as you want, but it should be profitable. Yes, that is correct, you the business owner or advertiser set the budget to whatever you want it to be, right in the Adwords interface per campaign. 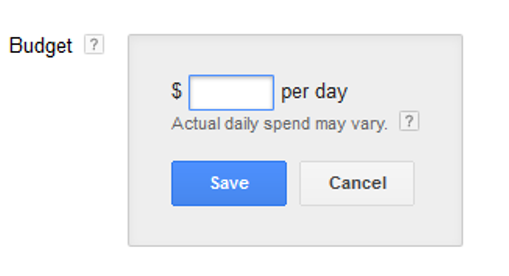 This functionality is in the “Settings” tab once you log into your Adwords account. Next, you navigate down the page until you find the “Budget” Section and then input the amount you’d like to spend. Note that this number is a DAILY number, not a weekly or monthly number so you need to backtrack how much you want to spend on a monthly basis and input the daily number here. Note that there are other kinds of budgets you can set in Adwords, such as shared budgets across multiple campaigns, but this is the most simple implementation at an individual campaign level. Now that we have the technical details out of the way on HOW to set your budget with Adwords, let’s get to the more important question how WHAT you should expect your budget to be with Adwords. One of the first considerations you should think about before deciding on a budget is what are your goals for advertising on Adwords? – To generate phone calls? – To generate ecommerce sales? Here is where you really need to get specific and get into very granular detail. – How many thousands or millions of people do you want to see your product or service? From there it is a matter of figuring out how much your revenue goals translate into “Ad Spend”. This will require some math to figure this out. Let’s say that your overall goal is to generate leads and/or phone calls from your site which in turn lead to sales. An overall goal of generating 30 sales or new customers over the course of the month is your goal. Now, because we have been tracking how well our leads/calls are converting to business for us, let’s say that each person that does business with us generates $400 in revenue. Of that revenue, $100 is profit. For the sake of argument, let’s just consider the first transaction here, not get into lifetime customer value, one year customer value, etc. So, in light of this, we could theoretically spend $100 to bring in a new customer. This is also known as a “Sale Cost Per Acquisition” goal, or the maximum amount of money you are willing to spend to get a new customer and still be profitable. For every 10 leads/phone calls that come in 5 become new customers. (OK, high conversion number here, but for arguments sake let’s consider this a local business and most of the leads generated are phone calls.) This is known as our Lead Conversion Rate. Now, let’s do the math on how much we should expect to spend on our budget to accomplish our goal of 30 new sales/customers per month. There we go, that should be our expected budget per month! If you’d like to find out more about outsourcing marketing campaigns, let us know by contacting us at the following page. OMG! How much AdWords costs is like asking how much are groceries or how long is a piece of string. No matter what business you’re in, the “How much?” question always pops up. Second bid Dutch auction. It’s not a hard concept to grasp if a person does their research and they will soon learn the bidding game is just that: A Game. Go in, bid the heck out of all the keywords that generate quality phone leads and you’ll never pay a penny above the top bidder. However, without keyword level call tracking, you’re back to the guessing game at best. Metrics man, Metrics. Why do so many people try to reverse engineer Google’s algorithm when it’s publically available in black & white? What disappoints me is when a SEO or SEM guru claims to have some alleged inside track on Google or that they used to work there, or the worst I’ve heard recently is that somebody is claiming Google is paying them to be a consultant. OH, BROTHER, GIVE ME A BREAK, will ya’? To answer the question directly, AdWords costs our shop $6K/mo. and is worth every penny of it because we can measure it. Yep. We have 50 keyword level call tracking numbers. But that’s not the half of it. Bing, Yahoo!, AAA, and even the freebie YP.com and RepairPal.com are on keyword level call tracking. We dumped both YP.com, YellowPages.com and two other services I don’t care to mention simply because they couldn’t make the phone ring, yet we still get free phone calls. As Eric said, if you can’t do this yourself, hire AMG. With that being said, I think the best use of a shop owner’s time is to manage and watch over their online campaign(s). AMG, and others, use WordPress for a reason. Although we don’t use WP, what I like about it the most is its fast load time. PageSpeed is off the hook. And, like HTML5, it’s device responsive. So, really all you probably need is one phone number for Adwords, one for Bing, etc (one per media channel) unless you are getting into larger ad spends, but the Call tracking company can help you determine how many #s you’d need based upon traffic. Again, another fantastic post Kurt. Few people address the the online advertising head-on as you. I know everybody will appreciate it. General Repair (GR) is way different than a transmission specialty shop and/or a GR shop installing transmissions. Our Average Repair Oder (ARO) is about $1,700 and our Major Average Repair Order (MARO) is about $3,400. GR work is typically typically has an ARO and/or MARO of much less. Much like the old Yellow Page days, a transmission shop typically pays more for the phone to ring due to the higher ticket totals which brings me to another point. They don’t call them “keywords” for nothing. My vote is to only bid on keywords that have the highest odds of generating big ticket work. Who wants to generate a $150 ticket when the lead costs $50 bucks? Here’s a great example: We are a transmission specialty shop that only does transmission and drivetrain work. At first blush, you would think the keyword “transmission” is a great keyword, and it is if you’re going after “clicks”, “traffic” and generally give a transmission shop’s website high metrics. However, we don’t bid on that keyword because it’s a “click burner” keyword. In other words, lots of clicks and activity, but few phone leads and the few phone leads we get off of that keyword are of very low quality due to the generalities of the word. 2-or-more words in a keyword, the better. It’s more specific. Not long tail, but in the middle. Shops need somebody who either knows this stuff or can easily figure it out as online advertising is not an exact science and each shop has their own unique personality. Heaven knows how much of our own hard earned dollars has been spent trying to get this stuff down. And right when you think you have it all figured out… Google, Bing/Yahoo changes the rules. 🙁 It’s never ending. I’m here to testify that online advertising works for us. Our website is homespun and so are our marketing campaigns. I don’t want to give anybody they can do this stuff themselves because since 2008 when we started with AdWords, we have spent over $200K and the stats are below. Mind you, this is me doing all the work and not paying anybody except Google. Add Bing&Yahoo and the numbers are even more. So, as I see it, I’ve paid about $40K a year, plus Bing and Yahoo for this adventure. A shop owner has to then ask him/herself, “Wow. Outsourcing would be cheaper, wouldn’t it?” Hmmm… my vote is yes. Kurt, keep up the great work!